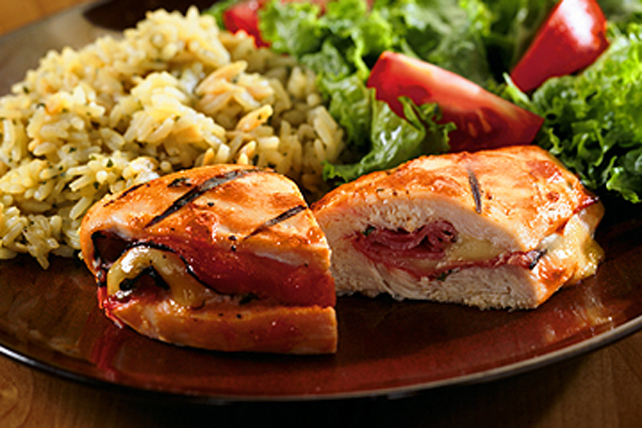 Achieve the signature taste of the classic stuffed chicken dish on the barbecue. Cut lengthwise slice in thickest long side of each chicken breast to make pocket, being careful to not cut all the way through to opposite side of breast. Combine chili sauce and onions; brush onto insides of pockets. Fill with cheese and ham. Close pockets; secure with wooden toothpicks. Mix remaining ingredients until blended. Reserve half the oil mixture; brush remaining oil mixture onto chicken. Reduce barbecue to medium heat. Grill chicken 16 to 20 min. or until done (165°F), turning after 10 min. and brushing with reserved oil mixture. Discard toothpicks before serving. If you frequently use boneless skinless chicken breasts in recipes, package them for the freezer in recipe-size portions. For best results, freeze the chicken as soon as possible after purchasing. Wrap tightly in plastic wrap, then in heavy-duty foil. Label and date each package to help keep track of the storage time. To use, remove the amount of chicken from the freezer that you need and place it in the refrigerator to thaw overnight.